Getting caught up in the daily rush is part of life in Japan and we wonder if it is possible to slow down. Kansai Scene talked with Andy Couturier while he rushed to prepare for a promotional tour of Japan for his new book, A Different Kind of Luxury. Many books on Japan rehash the same themes of uniqueness and eccentricity, perpetuating the stereotypes, and the life of the gaijin in Japan. 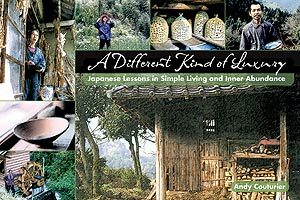 Essayist, poet and writing teacher, Andy Couturier’s A Different Kind of Luxury: Japanese Lessons in Simple Living and Inner Abundance looks beyond the shiny facade and deeper into the rural areas, at 11 people leading simple, but luxurious, lives on Honshu and Shikoku. Fifteen years in the writing, the book is based on Couturier's articles in The Japan Times. Couturier first arrived in the late 80s expecting a Japan even more money orientated and status conscious than the USA, but the image slowly shattered the longer he stayed. While here, he talked to people, including the old craftspeople of Kyoto, and met the people who are featured in his book while working on environmental causes. At first glance, what appears to be a book about people leading traditional lives is actually one about simple living. “I had an idea of ‘the traditional life’ as something that does not change,” Couturier says. “But each aspect of our heritage is not a thing but part of an integrated and connected life that shifts and moves with time. "My grandparents and great grandparents used cash to meet their needs, but as recently as the 1960s in Japan, in the mountains, rural people were still making almost all of what they needed without much interaction with the cash economy. Many of the people in this book could learn how to meet many of their own needs by walking down the road to speak with a nearby older man or woman." Time is a recurring theme in these chapters, not only in terms of tradition but how time controls our everyday lives. Osamu Nakamura (Chapter 2): "Humans have a tendency to create a visual image in their minds of what they think they can accomplish in a particular period of time. I felt ill at ease and irritable all the time. I eventually learned, however, to adjust my imagination, and plans, to what was actually possible." Text: George Bourdaniotis, Photos: Courtesy of Andy Couturier. Originally published in Kansai Scene #121, June 2010. Keep this book front and center on a bookshelf you are near every day. Any low point at all can be rescued by opening to a random page and reading for a while. How much we forget about life's simple fineness; how nostalgic this book makes me for countryside Japan where I spent a lot of time. Great post!